vitaminwater has partnered with Aaron Paul for its new ad campaign, titled “Drink Outside the Lines”, created in collaboration with Ogilvy. to dance his way through the workout (still on the treadmill) after having a moutful of vitaminwater zero. If, at the beginning, those around him look at him entertained, they soon begin doing fancy footwork, as well. 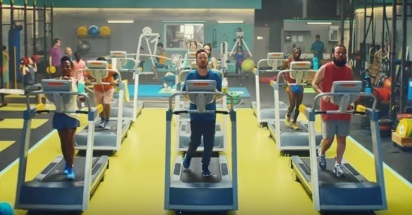 The song used in the ad is the groovy new single “Feel It Still” by American rock band Portugal. The Man, from their 2017 album “Woodstock”. during their everyday activities and do things a little differently… the vitaminwater way”. Paul revealed that he has always been a fan of vitaminwater and that he was really excited to show off his dance moves in this spot, which is set to will appear on television, digital and social platforms, and in movie theaters nationwide this summer.